Oskar Groening, 96, a former member of the Waffen-SS. A FORMER NAZI SS guard dubbed the “Bookkeeper of Auschwitz” has died aged 96 without ever having served his sentence for being an accessory to murder, German media have said. Oskar Groening was among the last former Nazis to face trial for their roles in World War II, more than 70 years after the conflict, thanks to a landmark case allowing prosecution for aiding and abetting the German killing machine. He worked as an accountant at Auschwitz, sorting and counting the money taken from those killed or used as slave labour, and shipping it back to his Nazi superiors in Berlin. He was also on several occasions assigned to “ramp duty”, processing deportees as they arrived by rail in cattle cars at the Nazi German death camp in occupied Poland. Groening was found guilty in July 2015 of being an accessory to the murders of 300,000 Jews at the camp and sentenced to four years in prison. Germany’s constitutional court ruled in late December that he must serve out his sentence, rejecting defenders’ argument that imprisonment at such an advanced age would violate his “right to life”. A court doctor determined that he was able to serve his sentence on condition he was given appropriate nursing and medical care but he was never jailed. As of the time of his death at a German hospital on Friday, according to the weekly Der Spiegel, there had been no response to a formal “request for mercy” filed in January in a last-ditch bid to avoid jail. One million European Jews died between 1940 and 1945 at Auschwitz before it was liberated by Soviet forces. Yet, of the camp’s 6,500 SS personnel who survived the war, fewer than 50 were ever convicted. The legal basis for prosecuting former Nazis changed in 2011 with Germany’s landmark conviction of former death camp guard John Demjanjuk. This argument also led to Groening’s conviction. He said he was “very sorry” for his actions. “No one should have taken part in Auschwitz,” he said. 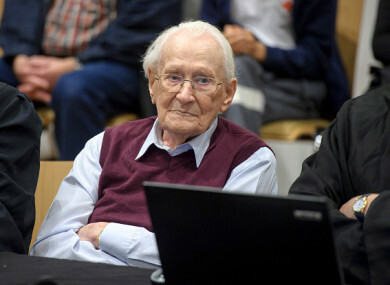 Email “'The Bookkeeper of Auschwitz' has died before he could be jailed”. Feedback on “'The Bookkeeper of Auschwitz' has died before he could be jailed”.